TYLER Wilkerson told reporters on Friday he once scored 72 points in one game in China about three years ago, a feat that couldn't be verified online. Whether true or said in jest, his 52-point performance on Friday for San Miguel was still quite remarkable as the Beermen put away their first win in the PBA Commissioner’s Cup. 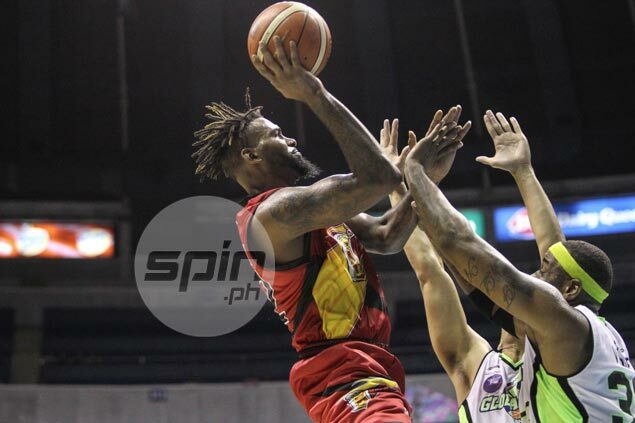 Wilkerson had a lot to do with that, hitting 17-of-29 from the field including seven three-pointers as the Beermen put away a 120-109 victory over Globalport on Friday night. “This is normal,” Wilkerson told reporters. “I hit 11 threes,” he said. On Friday, Wilkerson was close to unstoppable. He was already at 34 at halftime and raised his scoring out to 49 following a triple to beat the third-quarter buzzer. “I hit shots today. I was 7-for-11 (from threes). Shots were falling and my teammates were looking for me,” said the Marshall alumnus. “I just play basketball depending on what the defense is giving me. That’s who I’m going to play,” said Wilkerson, who was two points short of former San Miguel import Lamont Strothers’ 54-point output against Shell in Game Three of the Governors’ Cup best-of-three series. Wilkerson, whose scoring output eclipsed the previous conference best of NLEX’s Al Thornton (50), could have easily hit 60 had he not scored just three points in the fourth period. But the San Miguel import said he also controlled himself. “I felt that I scored what I needed to score to win the game. I didn’t come in and say I’m going to score 50. I just came to play and that’s what happened,” said Wilkerson.